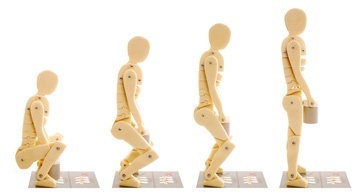 Workplace Health And Safety - What Are Your Business Obligations? 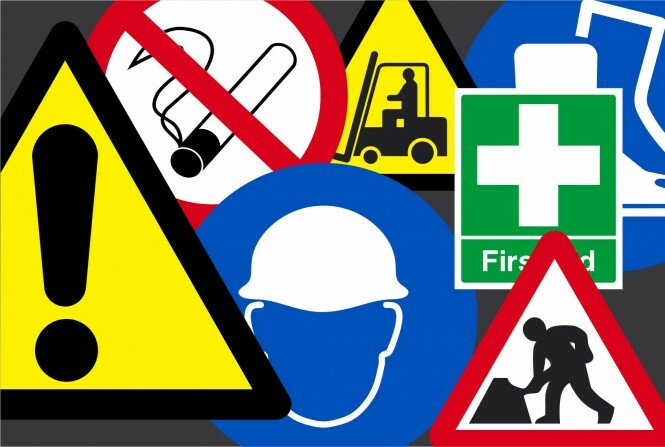 Workplace Health and Safety (WHS), often referred to as Occupational Health and Safety (OH&S) involves the assessment and migration of risks that may impact the health, safety or welfare of those in your workplace. This may include the health and safety of your customers, employees, visitors, contractors, volunteers and suppliers. As a business owner there are legal requirements that you must comply with to ensure your workplace meets WHS obligations. Worn and exposed wires such as old extension cords, leaking flammable fluids and gases, and running electrical cords under carpet are all mistakes to avoid in warehouses. When constructing a new warehouse, fire protection must be considered at the beginning of the design process rather than after it has been built or after the electrical work has been done. Attention tends to be paid to active systems, such as alarms and fire extinguishers, but by adopting an integrated approach that consider passive systems at the design stage, a warehouse can be better protected if a fire occurs. Technicians and trades workers, machinery operators and drivers, and labourers made up 31% of the workforce, but contributed 58% of total cases and 57% of total costs. Harsh chemicals, such as asbestos, are a serious workplace hazard, as is carbon monoxide fumes emitted by vehicles such as forklifts. Warehouses need to be well-ventilated so that fumes can disperse, and levels of noxious gases and fumes should be monitored. In addition, a number of hazards are posed when storing packaged dangerous substances if there is a lack of awareness of the properties of these substances and/or inappropriate storage conditions with respect to the hazards of the substances. Different types of dangerous substances should be assessed when considering a risk control strategy to ensure there is sufficient segregation. Futhermore, dangerous substances should only be received into a chemical warehouse by someone who understands all the risks they pose, in relation to their physical and chemical properties and quanities. Without proper training for all warehouse operators, not only will a warehouse fail to perform at its full potential but it will pose serious risks to all those in it. According to the Occupational Safety & Health Administration (OSHA) weekly fatality/catastrophe report, two workers are crushed to death every month on the job (this figure is for October 2014 to October 2015 and not limited to warehouse workers' deaths). 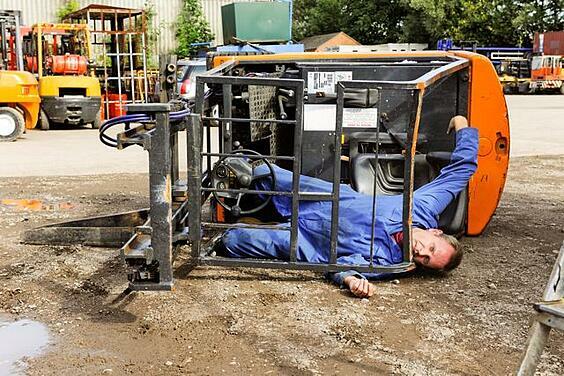 It can become dangerous if you underestimate the potential dangers of a machine, such as a forklift. 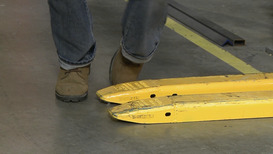 All operators must understand the potential hazards of all the machines present in the warehouse, regardless of how many years they have been working with the equipment, and undertake periodic training to keep up to date with the latest recommendations and remain cautious while using any machine. Accidents can be prevented by following the specific instructions provided for a piece of equipment; machines with moving parts are a common workplace hazard as they can cause the most serious permanent injuries when used improperly. No amount of experience can fully eradicate accidents - and actually, it has been known that the inexperienced staff members may take a more careful approach to machinery (going through all the checks) as the more experienced staff members think that they no longer need to do checks - and that is when accidents can happen. You may be surprised at how many accidents are caused by very capable and knowledgable staff members due to complacency. Effective employee training, well maintained machinery and systematic traffic management will reduce the risks, as opposed to unsafe methods and workplaces inflicting schedules on operators that are too demanding. Supervisors need to ensure that the piece of equipment in use, suits the specific workplace conditions and task in hand in order to avoid a potentially fatal incident. Warehouse managers need to analyse the reasons for past accidents rather than simply recording their outcome. Knowing a forklift driver suffered a broken arm does not tell the manager how to correct the operating procedures that caused an injury, however if the manager learns that the injury occurred when the driver's arm was outside the forklift's cage and he turned a corner too sharply, the need for driver re-training relating to procedure, speed and spacial awareness and the layout of the warehouse could also come into question. Every warehouse needs to be designed and maintained in a way that provides unobstructed exiting from any part of the building at all times, even if repairs or maintainence is being carried out to the building. When a warehouse is occupied, there should be no locks in place that could prevent free escape from the inside. Exits must be marked by clearly visible signs in languages that can be understood by everyone working in the warheouse. This includes indicating the pathway to the exit as well as the exits themselves. Warehouse managers should take a walk through their facility to ensure they can see an exit sign at all times and that there is no ambiguity - employees who are unfamiliar with the warehouse layout or reacting in haste to an emergency could easily confuse a closet or bathroom door with an exit, for example, especially if visibility is impaired due to a fire. All exit routes need to be free of explosive or highly flammable furnishings, and should not lead employees along a path that runs near hazardous areas. For more information on obligations to both workers and employees, click here. For the purpose of perspective, lets take a look at the 5 most expensive accidents in world history, in terms of property loss and measured in dollars. Take a look. 5. Piper Alpha Oil Rig, 1988 ($3.4 Billion - human error). The Piper Alpha disaster off the coast of Aberdeen is the world’s deadliest ever oil rig accident. At that time Piper Alpha Oil was the largest oil producer in the world producing 317,000 barrels of oil per day. On July 6, 1988, as part of routine maintenance, technicians removed and checked safety valves which were essential in preventing dangerous build-up of liquid gas. There were 100 identical safety valves which were checked. Unfortunately, the technicians made a mistake and forgot to replace one of them. At 10 PM that same night, a technician pressed a start button for the liquid gas pumps and the world's most expensive oil rig accident was set in motion. Within 2 hours, the 300 foot platform was engulfed in flames. It eventually collapsed, killing 167 workers and resulting in $3.4 Billion in damages. 4. Space Shuttle Challenger Explosion, 1986 ($5.5 Billion - equipment fault). The Space Shuttle Challenger explosion occurred when Space Shuttle Challenger (mission STS-51-L) broke apart 73 seconds into its flight, leading to the deaths of its seven crew members. The explosion occured because of a defect in O-ring. It failed to seal one of the joints, allowing pressurized gas to reach the outside. This in turn caused the external tank to dump its payload of liquid hydrogen causing a massive explosion. The cost of replacing the Space Shuttle was $2 billion ($4.5 billion in today’s dollars). Cost of investigation, problem correction, and replacement of equipment lost $ 450 million cost 1986-1987 ($ 1 billion today). 3. Prestige Oil Spill, 2002 ($12 Billion). 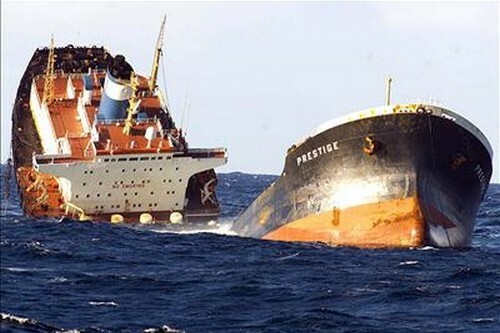 Prestige oil tanker was carrying 77,000 tons of heavy fuel oil when one of its twelve tanks burst during a storm off Galicia, Spain. Fearing that the ship would sink, the captain called for help from Spanish rescue workers, expecting them to take the ship into harbour. However, pressure from local authorities forced the captain to steer the ship away from the coast. The captain tried to get help from the French and Portuguese authorities, but they too ordered the ship away from their shores. The storm eventually took its toll on the ship resulting in the tanker splitting in half and releasing 20 million gallons oil into the sea. According to a report by the Pontevedra Economist Board, the total cleanup cost $12 billion. 2. Space Shuttle Columbia Explosion, 2003 ($13 Billion). The Space Shuttle Columbia was the first space worthy shuttle in NASA’s orbital fleet. Columbia was destroyed in re-entry over Texas on February 1, 2003, by an explosion resulting from a hole in its wing that took place during launch 16 days earlier. All aboard were lost. Total cost of accidents (does not include replacement of a round-trip transportation) estimated at 13 billion dollars according to the American Institute of Aeronautics and Astronotika Sciences. 1. Chernobyl, 1986 ($200 Billion - human error). The world witnessed the most expensive accident in history. The Chernobyl disaster, widely considered to have been the worst nuclear power plant accident in history, and is one of the level 7 event (the maximum classification) on the International Nuclear Event Scale. The accident was officially attributed to power plant operators who violated plant procedures and were ignorant of the safety requirements needed. Chernobyl accident was considered the greatest socio-economic catastrophe recorded history. 50% part of Ukraine is influenced and contaminated. 200,000 people evacuated and transferred, while 1.7 million people directly affected by the disaster. The death victims attributed to Chernobyl, including those who died from cancer after many years, about 125,000. Nobody knows exactly how much the world’s worst nuclear accident cost. $200 billion is considered a fairly conservative figure including cleaning, transmigration, and the compensation of victims. The cost of a new steel shelter for the Chernobyl nuclear plant will cost $2 billion alone.